The South of Scotland League campaign continued last Saturday with a full list of fixtures scheduled to be played. The two teams presently leading the pack, Heston Rovers and St Cuthbert Wanderers, locked horns at St Mary’s Park with both teams having started their league campaign on a high note to take full points from their first four matches. In a very close match the visitors took the lead after twenty-five minutes play when Sean Kevan scored to give Heston a slender advantage which they took into the break. Heston dug in for the second half and defended well to keep the Saints’ forwards at bay but, with almost ninety minutes played, the home side were awarded a penalty which was converted by Sam Warren to give Saints a share of the points. Last season’s champions Wigtown and Bladnoch travelled to Sanquhar to play Nithsdale Wanderers for a match that also went close with the visitors coming out on top by the odd goal in three to keep up their challenge on the early leaders. Upper Annandale entertained Edusport Academy with the visitors taking the three points in a comfortable six goals to nil victory. Lochar Thistle hosted neighbours Dumfries YMCA for a match they won by five goals to two while Creetown just failed to take anything from their match against Abbey Vale at Castle Cary Park. Stuart Clark opened the scoring in the first half for Vale to give them a half time lead with Alan McClymont levelling the match with sixty three minutes played. However within two minutes Danny Thom restored Vale’s lead and the visitors held on to take their first three points of the season. Fleet Star played Mid-Annandale at Gatehouse for a match that looked very even but the Lockerbie side proved too strong for Star and went on to win by four goals to one. Striker Nathan Muir scored twice in the first forty-five minutes to give Mids a comfortable half time lead. Muir’s goals came from a header in the thirty-minute followed by a penalty kick conversion after Andy White had been brought down. However within a minute of the re-start Kevin Jamieson scored to give Star some hope but Darren Notman put the game beyond the home side with five minutes to go and Muir completed his hat-trick from the penalty spot in the final minute to wrap up the three points. Crichton entertained Newton Stewart at Hospital Park with the visitors taking the lead in the first half when youngster Aaron McGuire volleyed the ball into the net following some good outfield play by striker Robert Middleton. Newton took this narrow lead into the break but Crichton reappeared looking much more determined than they had been in the first half. 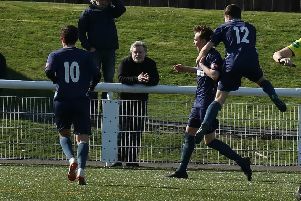 This determination led to striker Darren Johnstone levelling the match but the visitors restored their lead when John Lowe converted from the penalty spot. However the home side began to dominate play against a very young Newton side, who finished the match with six players under eighteen years of age, and went on to score another three goals with the fourth one coming from Johnstone right on the final whistle.